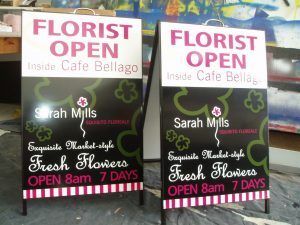 Advertising A frame signs, otherwise known as sandwich boards are a great economical way to promote your business, brand or product and are a sure way to capture drive and walk by attention. A frame signs are an easy portable, lightweight solution suitable for indoor or outdoor use. 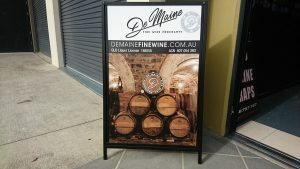 We produce and install brilliant quality, full colour, custom printed, UV laminated A frames, made to suit your needs. Signsations advertising A frame signs come with quality outdoor print and recommended durable UV laminate for added protection. Wire A frames with interchangeable printed corflute signs. Great for changing promotions and specials. 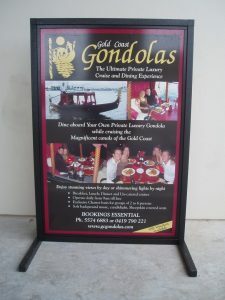 Signsations can professionally design your advertising layout for your custom A frame sign. If you are supplying your own artwork file, please read artwork specifications.